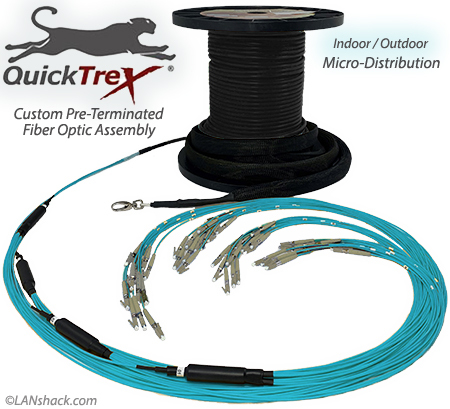 QuickTreX Indoor/Outdoor Pre-Terminated Fiber Optic Assmblies are perfect for connecting the networks of two buildings through the use of an underground conduit. This fiber is suitable for Indoor and Outdoor use, so there is no 50 foot fire code requriment traditionally found with Outdoor cable. The Indoor/Outdoor cable has a water blocking aramid yarn strength member surrounding the fiber optic strands to protect from sititations where light water infiltration may exist like in an under ground conduit or also in an Indoor situation where the asssemly may be exposed to a damp or moist enviorment. 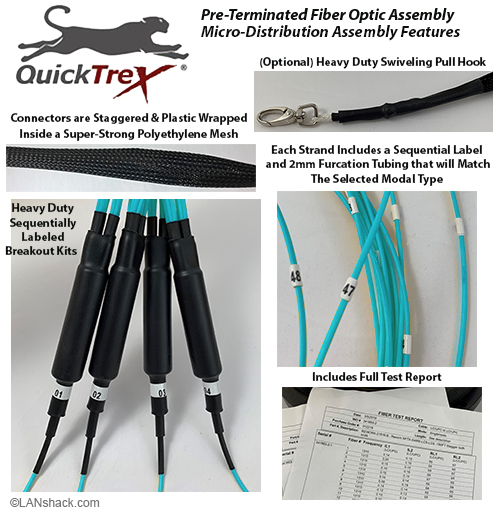 QuickTreX® brand, custom Pre-Terminated Fiber Optic Assemblies have a longstanding reputation for quality and reliability. When we receive your custom order, we build the assembly to your specifications using the finest materials to our exacting standards. The assembly is made in the USA by skilled technicians under controlled conditions and comes to you fully tested and ready for immediate installation. * Plenum rated Indoor/Outdoor jacket can be used upon request.